Posted on May 10, 2010 by Barbara H.
Some of you will have seen this information already, but I wanted to write a post of the reasoning behind and information about The Week In Words to link back to when sharing it with others. 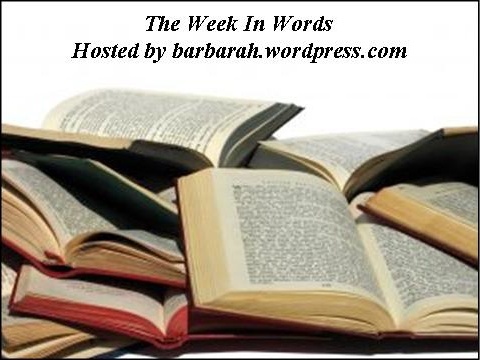 The Week In Words was begun by Melissa at Breath of Life, but when she became unable to host it any longer, she offered for one of her readers to take it on, so I accepted. If something you read during the past week inspired you, caused you to laugh, cry, think, dream, or just resonated with you in some way, please share it with us on Mondays. The source can be a book, newspaper, blog, Facebook — anything that you read. My only stipulation is that we keep it family-friendly. There will be a Mr. Linky here on Monday mornings for you to share your Week In Words post with others, and then you can enjoy perusing the quotes that others have found. I hope you’ll join us! This entry was posted in Quotes, The Week in Words by Barbara H.. Bookmark the permalink. I am so lazy that I rarely ever mark the quotes I love — and then of course I regret it later. However, I may give this a try. Just don’t expect too much …. LOL, your scroll box worked. Hooray! As for the meme… a wonderful idea. Looking forward to reading your posts. How do I follow this site. I have a followers section on my blog and when on other blogs with the same I can click on it and sign up so that site is always coming up on my blog dashboard and that way I do not loose it. I so loved the quotes especially Hudson Taylor. I have several of Elizabeth’s books and find comfort and inspiration in them. I would like to follow Weeks in Words. I think only Blogger blogs have that “follow” button, and unfortunately it only works for Blogger blogs and not WordPress blogs, like mine, or Typepad or other blogs hosted at other places. Many people follow blogs through Bloglines (www.bloglines.com) or Google Reader (go to http://www.google.com, click on “More,” then click on “Reader.”) When you sign up with either of those, they have a button you can click on to follow any blog hosted by any company. I am always underlining things in my bible and other devotional material as well as my recreational reading. I will be keeping my eyes out this next week for something to link up with next week!